Nick Russoniello, one of Australia’s most dynamic young artists, enjoys an exciting and varied performance career both in Australia and abroad. Nick was named the 2011 ABC Symphony Australia Young Performer of the year and has appeared as a soloist with the Adelaide, Queensland, Melbourne and Sydney Symphony Orchestras. Nick’s 2012 performance schedule includes; appearing at Sydney Festival’s Symphony in the Domain as a soloist with the Sydney Symphony Orchestra in front of an estimated audience of 50 000 people, touring regional N.S.W as a soloist with the S.S.O, performing at the World Sax Congress (Scotland) with Continuum Sax and renown Dutch Ensemble The Four Baritones alongside Arno Bornkamp, performing with the S.S.O and jazz legend Nat Cole, performing for the P.M and heads of Australian Industry at Parliament House and completing a number of recordings for ABC Classic FM. 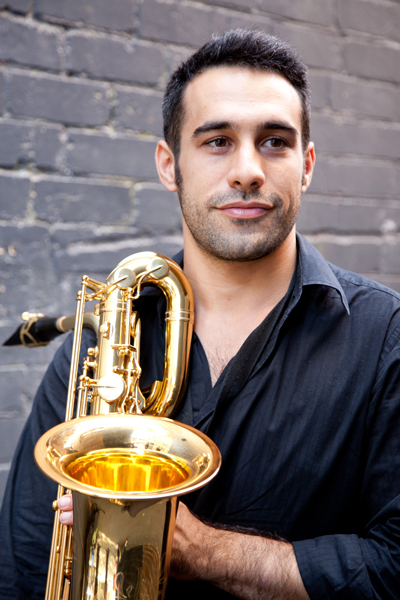 Currently based in Sydney, Nick is a sought after chamber musician and performs as a member of Continuum Sax (Australia’s foremost saxophone quartet), Duo Histoire (with guitarist Murilo Tanouye) and The Sax Summit. With these ensembles Nick performs regularly across Australia. Nick holds a BMus (First Class Honours) from the Sydney Conservatorium of Music. He has studied internationally, completing a Biennio II at Milan’s G.Verdi Conservatorium (Italy), attending the European Summer Saxophone University (France) and undertaking a study trip to the U.K with the assistance of the Big Brother Movement.